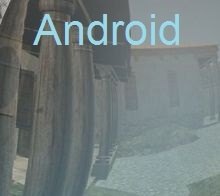 Specific to Albesti community, an Android VR application was created with Unity3D, which helps users have an immersive experience inside a Hellenistic farm. For other immersive experiences See also Vadastra, Mangalia and Cucuteni communities. CLICK the image to download “Albesti2016″ on your smartphone, an Android application for Cardboard (educational app by Liviu Ungureanu). First activate an internet or wireless connection and access this page from your smartphone. See also Vadastra and Cucuteni Mobile-Learning.